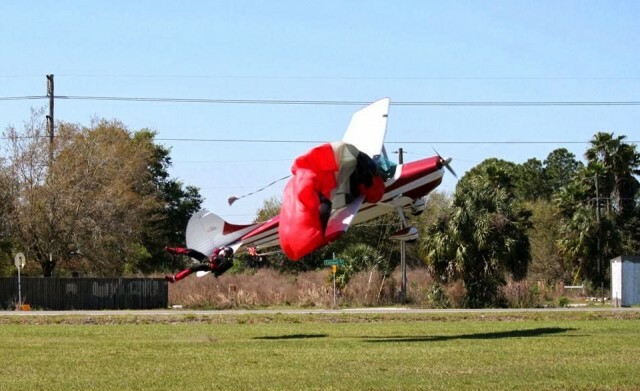 The final report ERA14LA146 was released last month for the incredible collision between an aircraft and a parachutist with only minor injuries (and a totalled Cessna) as a result. 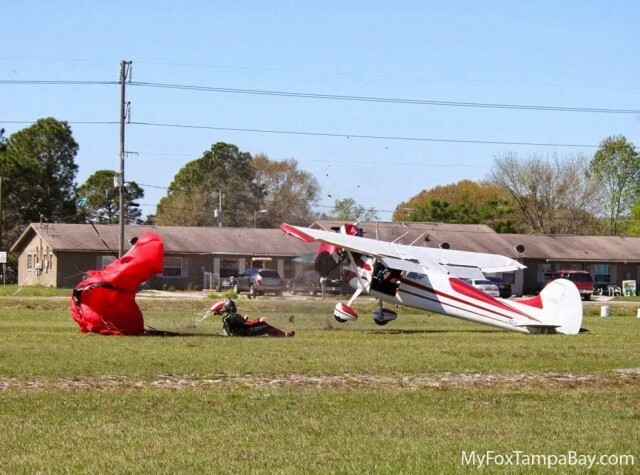 The accident happened at South Lakeland Airport in Florida on the 8th of March 2014. It was a clear day, blue skies and a light 3-5 knot wind. South Lakeland Airport is an uncontrolled grass strip at the edge of Lakeland’s Class D airspace. The pilot was an 87-year-old WWII veteran who has been flying all his life. He was flying in the circuit and had done three touch-and-go landings on runway 32: touching down on the runway to immediately take off and go again. He was aware that skydiving operations were in progress. 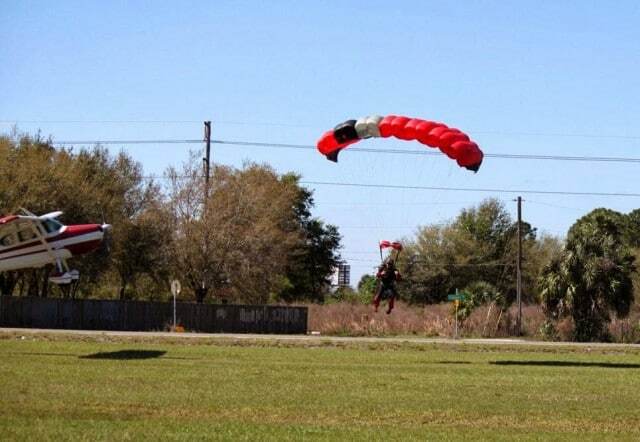 While he was flying, another aircraft with a group of parachutists had departed South Lakeland Airport and climbed to jump altitude. The skydiver in question was the 4th skydiver to jump. He deployed his parachute and manoeuvred to be parallel to the runway. He was watching another skydiver at about the same altitude and then initiated a left-turn so that he would land into the wind. His approach path crossed the approach end of runway 32. Meanwhile, the pilot called out that his next approach would be for a full-stop landing; he was finished practising for the day. 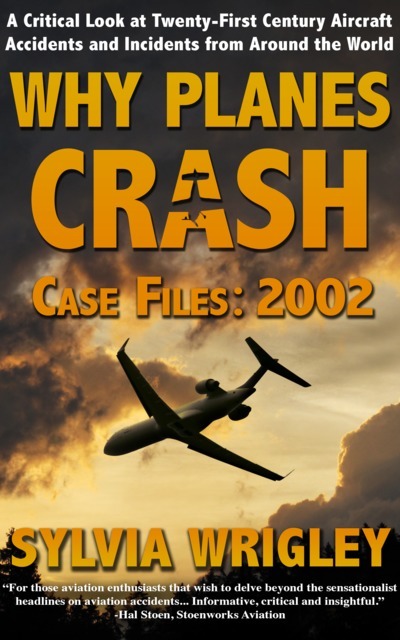 Robert Goyer of FLYING knows the airfield and wrote about it a few days after the accident. The airport is pretty small, and there’s a two-lane highway immediately to the east lined by power lines, which you can see in the photographs. There are tall trees at the departure end of the runway, but with more than 3,000 feet of available runway, the power lines are the greater hazard until after you’ve climbed out initially. On approach to Runway 32, there are high tension lines. It feels as though you’re descending into a funnel with only one place to go. On approach to Runway 32, where the Cessna was doing touch and goes, you can go missed in a emergency by executing a right turn over the airport grounds. Otherwise, once you’re as low as the Cessna was and already rotating for a touch and go, the options are even more limited. What’s clear is that neither of them had seen the other and both were on their final approaches without any awareness of a conflict. The Cessna 170 was on short final coming in to land as the skydiver glided across the runway. 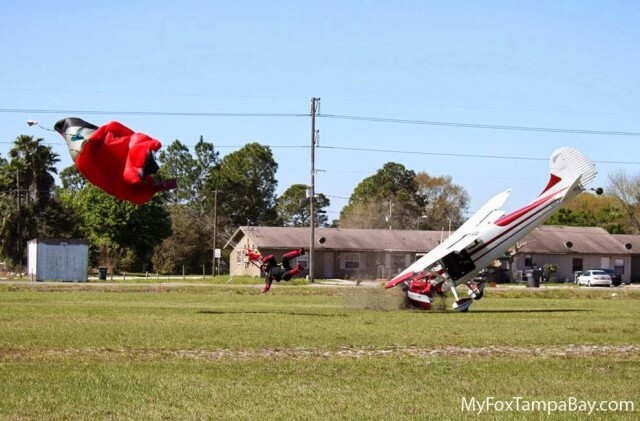 They were 75 feet above the ground when the pilot saw the skydiver. Tim Telford was taking photographs of the skydiver as he was about to touch down and he couldn’t believe what he saw. 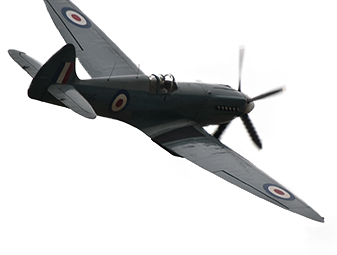 The pilot immediately climbed in a desperate attempt to avoid the man who had effectively dropped into his view. However, he wasn’t able to climb over the parachute and his right wing caught the parachute’s suspension lines. The Cessna pitched up and then down. 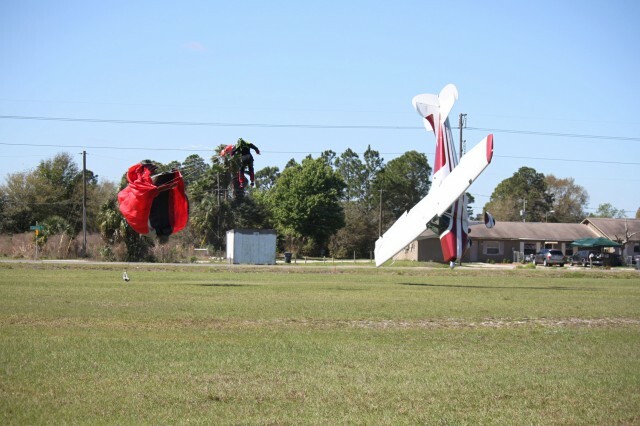 The skydiver was pulled up into the air like a marionette and then dropped to the ground as the nose of the plane sliced through the strings of his parachute. The aircraft crashed nose-first into the runway. 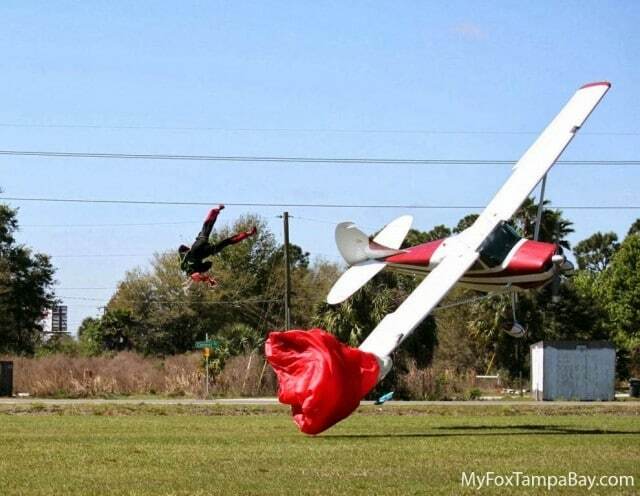 Unbelievably, both the pilot and the skydiver suffered only minor injuries. They were taken to hospital immediately but suffered only bruises, no broken bones. 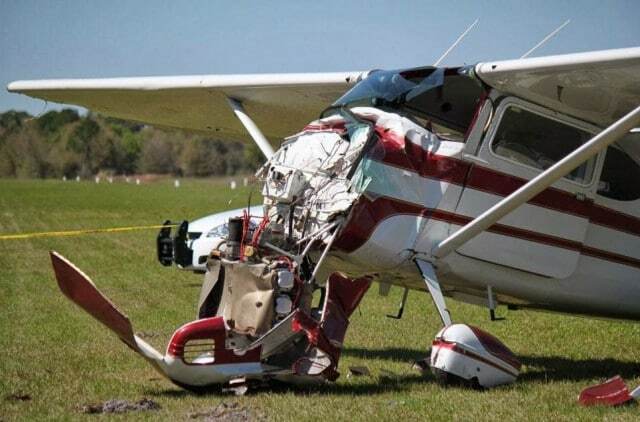 The Cessna 170, on the other hand, was a write-off. 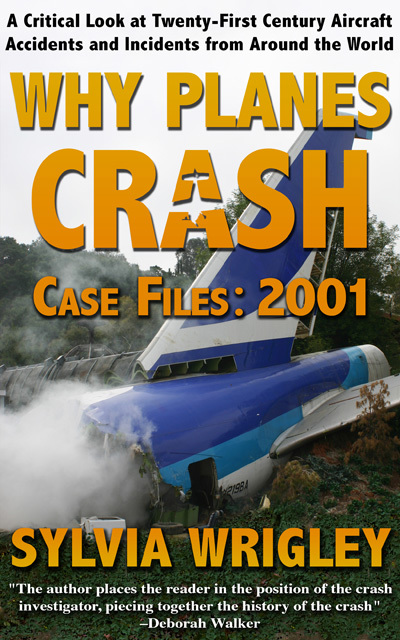 The NTSB report categorised the accident as a “collision with terrain/object (non-CFIT)” and “Uncontrolled descent” which I suppose is the closest they have for a mid-air collision of man and plane. 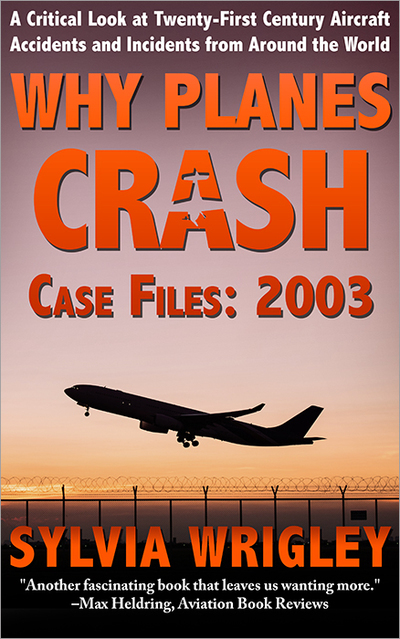 The failure of the pilot and the parachutist to see and avoid each other, which resulted in the airplane’s wing colliding with the parachute’s suspension lines. The point is that both the pilot and the skydiver were responsibile to “see and avoid” the other traffic in the circuit. The fact that neither of them had a clue that the other one was there means that they were both at fault for the resulting collision. I’m lucky enough to have never flown into an airfield at the same time as parachutists were dropping. I’ve been a passenger, though, and it’s a case of constant looking out and making sure that you know where the jumpers are and that there’s no chance of getting close to them. Even if the high wing of the 170 hadn’t blocked the vision of the pilot — and who looks for parachute traffic on rotation? — there was probably not enough time to get stopped without there being a collision. The pilot, likewise, was surely busy on the arrival over trees and power lines before setting up for the touch and go. The parachutist likely had few options as well. New chutes are fairly maneuverable compared to old fashioned models, but there’s only so much a chutist could do under the circumstances, especially since he’d just cleared power lines behind him. It does seem a bit unfair to the pilot, as the skydiver was out of his drop zone and should not have been landing on the active runway. I just think that on short final, you can’t really expect to see someone coming dropping down onto you from above. Your attention is ahead of you, gauging the touchdown point and ensuring that the runway is free of obstructions; I don’t think it would occur to me to be looking up! The good news is that both pilot and skydiver were fine and said they planned to continue their hobbies despite the scare. And Tim Telford got the photographs of his life! I started my own career in aerial advertising, also know as “banner towing” in 1969. I think I did about 3700 hours of that. My first job was in Germany, later in the Netherlands. We mainly did this in Piper PA 18 Super Cub but also with Cessna 172 and the occasional other types like Morane-Saulnier or Aeronca Champion. Banner towing was big business in the 1960’s and 1970’s. We used to fly 8 hours a day, sometimes more and at the close the entire summer season we could have logged between 500 and 700 hours ! Beaches and resorts were main target areas and the only days off would be when we could not fly VFR. Since we would be paid by the flying hour, we would go out as soon as the visibility had improved to the prescribed minimum of a mile (measurable because a church tower was just about that distance from the airport office) and we would continue as long as we could. Which meant that not infrequently we were nowhere within legal VFR limits and still flying. Instruments: an RPM counter, cylinder head temp, oil pressure, airspeed, liquid compass and altimeter. We also had VHF radio but that was about all. If the weather closed in most of us still managed to find the aerodrome, even with a cloud base below 200 ft and a visibility that would worry an airline pilot on the ILS. In the Netherlands we were based at Hilversum (EHHV), a square meadow of about 400 x 500 meters. There was no runway in those days, just a landing T.
In summer, part of the field would be reserved for gliders. But the fun would start after 18:00 when the flying school wound up and the parajumpers would come out. From my account about VFR being defined as “any weather allowing the pilot to find the aerodrome back without losing his (only a few “her”) banner on trees or power lines” it is clear that we did not really bother much about rules and regulations. In later years the authorities were not so lenient and I have had first officers giving me a very strange look when I told them about the “Good, wild old days”. The PA 18 could stay about 4 1/2 hours in the air. With banner the airspeed was usually not relevant, often the ASI indication was near zero as we would fly at stall speed. The fuel quantity indicators were little floats in glass tubes. Some Pipers could stay aloft for 15 minutes or more after the float disappeared from sight, others ran dry with the little ball still visible. So we refuelled the aircraft ourselves, making sure that the tanks would be full to the brim, make the take-off on one tank to be sure that it would be OK and then switch to the other one. We would fly on that one until dry, switch only after the engine stopped. So we knew right to the minute how much time we had left. After the last flight, having flown perhaps 9 hours, we would drop the banner and use the last minutes to do a bit of dog fighting or aerobatics. The Super Cub is not approved, of course, but will spin, loop and do barrel rolls just fine as long as there is no negative “G”. That period of “Wild West” often coincided with the activities of the para clubs who came out during the last few hours of summer sunshine. Insofar as I am aware, in spite of the otherwise gross violations committed by the banner pilots, there was never any conflict. I was caught out once. The aircraft were already being put back in the hangar. I was one of the last pilots and decided to “buzz” the aerodrome. Unfortunately, two cops were enjoying a cup of coffee on the terrace of the flying club when my propwash spoiled it by blowing dirt from the roof of the clubhouse into their cups. I was given a fine which was worded something like “operating an aircraft above Hilversum aerodrome at an altitude below 500 feet without intention to land and without permission from the aerodrome manager” = buzzing the field. I was carried away, swept along by the tide in “memory lane”. But I reckon that the judge’s decision to share the blame was purely legalistic as a parachutist has the “right of way”. He or she can go only one way: down. In theory an aircraft can make an overshoot. 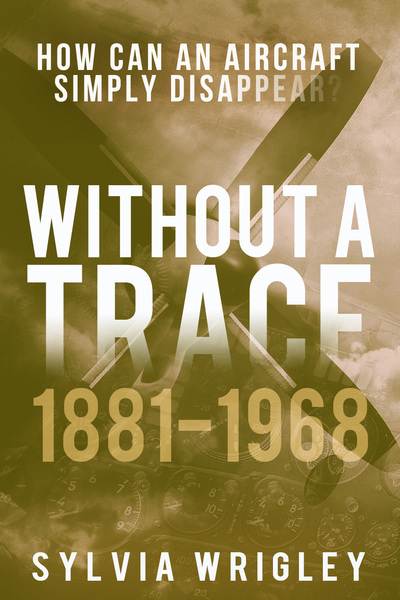 Having said that: I doubt that even an ace fighter pilot would have been able to avoid the accident. I probably would not, either.